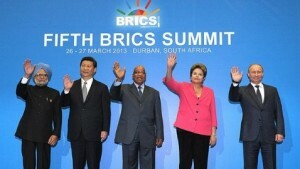 The statutes of the new BRICS Development Bank will soon be concluded, according to Brazil’s foreign minister. “We made good progress during the last meeting in Durban and the expectation is that in the 2014 meeting in Brazil, enough progress has been made to conclude the statutes of the bank,” Antonio Patriota told reporters in Brasilia. South African Minister of International Relations Maite Nkoana-Mashabane endorsed Patriota’s assertions, saying the five finance ministries are putting the final touches to the recommendations. “There was an agreement to establish such a bank. Our ministries of finance are busy with the final modalities because the viability has been checked, even economists from the World Bank have come out to say there is space for such a bank,” Nkoana-Mashabane said after a meeting with the Brazilian foreign minister. Nkoana-Mashabane is on a working visit to Brazil to attend the Fifth Session of the South Africa-Brazil Joint Commission. The establishment of the BRICS Development Bank is largely seen as the first significant step of the bloc of five. The bank was announced during the fifth BRICS Summit in Durban in March this year. “We have agreed to establish the new development bank. The initial capital contribution to the bank should be substantial and sufficient for the bank to be effective in financing infrastructure,” the BRICS leaders said in a joint statement. BRICS leaders will meet on the sidelines of the G20 summit in St Petersburg this September where they will be updated on the status of the Bank.